classic shape and brilliant colors of russet brown, celadon green, golden yellow and fiery red. appetizers and desserts and are delicious fresh or cooked in a variety of ways. texture of each pear variety enhances both wine and cheese flavors, which is why this classic trio holds a place of honor on tables around the world. The Anjou, also known as the d’Anjou, is wonderfully sweet, fragrant and succulent when fully ripe. It has creamy-white, tender flesh and a mellow, delicate flavor with undertones of lemon and spice. The Anjou’s clean flavor and fresh aroma make it great for snacking, adding to a salad, or serving with cheese. Try this pear with a Montrachet Chèvre and Sauvignon Blanc or with Camembert and a Demi-Sec Champagne. Chèvre means goat in French and is a general term for French goat cheeses. Montrachet, a popular chèvre in the United States, comes from France’s Burgundy region. Young chèvres are mild, with a soft texture and tangy finish. As chèvres age, the flavor becomes more complex and earthy. The Montrachet version complements the Anjou and will not overpower its delicate flavor. Camembert is a soft ripened cow’s-milk cheese from Normandy, France. Its creamy, smooth texture and pale yellow interior are reminiscent of Brie, and its mushroomy character (with subtle notes of garlic and truffles) makes it a good match for the spicy undertones of an Anjou pear. Sauvignon Blanc is a white wine grape widely cultivated in France and used to make the Loire Valley’s famous Sancerre. It is also well established in New Zealand, as well as America’s Pacific Northwest. This white wine can taste of many things (grapefruit, honeydew, pineapple, grass, citrus, herbs), but it is typically clean and crisp and makes a fine partner for Anjou and fresh and tangy goat cheese. Demi-Sec Champagne, a sparkling dessert wine, is 3.3 to 5 percent sugar, making it a good match for the Anjou’s sweetness. Its effervescence cuts through the mouth-coating effect of double- or triple-crème cheeses like Camembert and prepares the palate for the next bite of pear. The Bartlett has a quintessential pear flavor (sweet, buttery, musky and a little herbaceous) and fragrance. This succulent pear is delicious cooked or fresh and makes a wonderful addition to salads. Try Bartlett pears with mascarpone cheese and Brut Champagne. Gouda cheese and Merlot make a terrific alternative match. Mascarpone is a fresh, spreadable triple-crème cheese from Italy made from the cream of cow’s milk. One of the richest of cheeses, mascarpone has a smooth, buttery texture that compliments the juicy Bartlett. Mascarpone’s rich, yet subtle and delicate flavor work well with the aromatic Bartlett. Gouda is the Netherlands’ most famous exported cheese. It is made from whole or part-skim cow’s milk and is aged anywhere from four months to two years or more. Gouda has a mild, nutty flavor when young; it sharpens with age and takes on hints of honey, caramel, spice and butterscotch. Aged Gouda also has a firm texture and lovely amber color, and it plays nicely off the Bartlett’s sweetness. True Brut Champagne comes only from the Champagne region of northeast France and is usually a blend of Chardonnay, Pinot Noir and Pinot Meunier grapes. That said, many Washington and Oregon vintners use the traditional French method and grapes to produce outstanding sparkling wines. “Brut” simply means the wine is dry (or less sweet), and its toasty, nutty flavor enhances both the sweet Bartlett pear and the rich mascarpone cheese. Merlot is made from a red-wine grape by the same name that originated in France’s Bordeaux region and is now also a star performer in Washington. It has a soft, mellow, fruity flavor that complements the Gouda-Bartlett duo. The Bosc is a firm-textured but juicy pear that’s excellent for cooking and baking. It also poaches beautifully. When ripe, Bosc pears are aromatic with a nutty, spicy flavor and undertones of vanilla, caramel and spice—an excellent partner for aged Cheddar and Cabernet Sauvignon. Or try a Bosc with Parmigiano-Reggiano and Barbaresco. Cheddar originated in England and is usually made from whole cow’s milk. Colors range from white to golden to orange. As Cheddar ages, the texture becomes more crumbly and granular, and its rich, nutty flavor sharpens and becomes more complex, taking on nuances of nuts, apples and hay. The Bosc pear’s dense flesh and savory, spicy-sweet flavor hold up well against this cheese’s firmness and tangy finish. Parmigiano-Reggiano is a hard, dry Italian cheese made from skim or part-skim cow’s milk. The best have a straw-colored interior and a zesty, salty and sweetish flavor. With its crumbly, granular texture, this cheese makes a perfect foil for the buttery richness and juiciness of Bosc pears. The Cabernet Sauvignon grape is a native of France’s Bordeaux region. It is often blended with other grapes to produce outstanding red wines, though many Northwest examples are made with 100-percent Cabernet Sauvignon grapes. This wine is full-bodied, tannic and fruity, with an intense, complex flavor that holds up well to the sturdy character of aged Cheddar and Bosc pears. Wine experts consider Barbaresco one of the best Italian reds for cheese. It is slightly acidic, full-bodied and well rounded. Its mild, herbaceous nose complements the savory spiciness of Bosc pears and Parmigiano-Reggiano. Comice, one of the sweetest and juiciest of all pears, has a delicate flesh with a meltingly smooth, creamy texture. The flavor is mild, but with enough sugar and acid to create an appealing note of sharpness. This full-bodied flavor makes the Comice pear especially good for dessert; it’s wonderful with Gorgonzola and Marsala after a meal. For an alternative match, try Danish blue cheese and Sauternes. Gorgonzola originated in Italy’s Lombardy region, and is one of the country’s most famous cheeses. This rich and creamy blue cheese is made from cow’s milk and has an ivory interior with greenish-blue striations. There are two varieties: dolce, a soft, mild aromatic cheese; and naturale, an aged Gorgonzola with a more assertive flavor. Both are creamy with a touch of spice and sweet on the tongue that makes them a wonderful match for a Comice pear and a glass of Marsala. Danish Blue Cheese is modeled after some of the better-known French blue cheeses. Made from cow’s milk, Danish blue cheese has a smooth, creamy texture and rich, zesty flavor. The cheese’s complex, pungent and slightly salty taste provides a pleasing contrast to the sweetness of the pear. Marsala is one of Italy’s most famous fortified wines. Imported from Sicily, Marsala is often used in cooking, but the finest are certainly worth sipping with pears and cheese. While Marsala can range from dry to dessert-sweet, the best develop a rich and smoky raisin-like flavor after aging for years in wood casks. Marsala, Gorgonzola and Comice pears make a toothsome combination. Sauternes is a late-harvest white dessert wine from France. The grapes are infected with botrytis cinerea (also called noble rot), a beneficial mold that makes them turn brown and shrivel, concentrating the sweetness and acidity of the wine. Sauternes is intensely sweet and has undertones of honey, hazelnuts and oranges, making it a classic match for Danish blue cheese and pears. Forelle pears are small but very juicy with a mild, sweet and slightly spicy flavor. Even when ripe, Forelles maintain their crispness. Although the pear’s flavor and texture work well for cooking, its small size can make it challenging to work with. It is mostly eaten out of hand or used in salads. 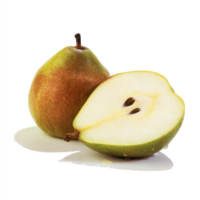 Forelles have a full pear flavor and firm texture that makes them an excellent choice for serving with cheese. Try it with Port-Salut cheese and a dry Riesling or Monterey Jack and a sweeter late-harvest Riesling. Port-Salut is a French cheese originally made by Trappist monks in the nineteenth century. This semisoft cow’s-milk cheese has a mellow, nutty flavor and a creamy texture that complements the Forelle’s spicy sweet flavor and firm texture. Monterey Jack is an American original first produced near Monterey, California. A cow’s-milk cheese, Monterey Jack has a delicate, buttery flavor and creamy texture that pairs well with sweet, crisp Forelle pears. Riesling is one of the world’s great white wines. While it originated in Germany, Washington is now a noted producer. Rieslings range from bone dry to very sweet, and they are known for their complex flavor and excellent balance of acidity and sweetness. Dry Rieslings have a crisp, fruity flavor with hints of apricot, peaches, honey and apples. This wine makes a superlative match for both the Forelle’s and Port Salut’s nutty flavors, and its dry finish prepares the palate for the next delicious bite of pear and cheese. Late-harvest Riesling is made from grapes that hang on the vine until they dehydrate and shrivel, which concentrates the sugars and produces sweet, rich wines with undertones of honey. Monterey Jack’s buttery flavor finds an excellent partner in a late-harvest Riesling, and it complements the Forelle’s sweet flavor without being overpowering. Seckel is one of the smallest pears, but it packs a lot of flavor and juiciness into a tiny package. This pear has an intriguing perfume with floral and spice notes and a complex flavor. Intensely sweet, Seckels are sometimes called sugar or honey pears. They have a creamy, buttery texture when fully ripe and are delicious when pickled, made into preserves or eaten out of hand. Match them with Fontina and Pinot Noir or Havarti and Beaujolais. Fontina is a semi-firm cow’s-milk cheese that originated in Italy’s Piedmont region. It has a creamy, pale ivory interior that becomes more crumbly as the cheese ripens. Fontina’s nutty, buttery flavor and earthy finish go well with the Seckel’s sweetness. Havarti is a semi-soft Danish cheese with a buttery, mild and tangy flavor that intensifies and sharpens with age. It’s made from whole cow’s milk and has creamy texture that melts into a Seckel. Havarti’s mildness matches nicely with Beaujolais. Pinot Noir is a food-friendly wine with a spicy, complex character and lots of ripe red and black fruit. The classic grape of burgundy has adapted well to Oregon, where wine makers are producing many outstanding examples of this versatile wine. It’s lovely when served with the sweet Seckel and creamy Fontina cheese. Beaujolais is a light, fruity red wine that originated in France’s southern Burgundy region. It mellows Seckel’s spiciness and complements the Havarti’s buttery mildness. Starkrimson is a mild, sweet pear with a subtle flora aroma. It is very juicy when ripe and has a pleasant, smooth texture. The pear earns its name from its brilliant crimson skin, which is thin and delicate when the pear is ripe. Starkrimson’s refreshing flavor makes it wonderful as a snack or used in a salad, where its vivid color adds eye appeal. Brie and Reserve Chianti make a great match for Starkrimson, as does a duo of Stilton and a tawny Port. Brie is a soft-ripened cheese made from cow’s milk and is one of France’s most famous cheeses. It has a creamy ivory interior and a beige-white edible rind. The rich earthy, nutty flavor enhances the aromatic Starkrimson pear, while its creaminess pleasantly contrasts with the pear’s firmness. Stilton is one of best known English cheeses. This classic blue cheese is made from cow’s milk and aged four to six months. During aging, it is injected with Penicillium roqueforti, a flavor-producing mold that gives the cheese its blue-green veins. Stilton’s pungent flavor and creamy yet crumbly consistency provide a nice contrast to the Starkrimson’s sweet mildness. Chianti is a full-bodied Italian red wine that is traditionally made from the Sangiovese grape, though more modern blends often include four or more other varietals. Reserve Chiantis have been aged in oak for at least three years before bottling. This wine has a slightly fruity, tannic finish that cuts through the Brie’s creamy texture while highlighting the cheese’s earthiness and blending with the pear’s sweetness. Tawny Port is a sweet fortified wine produced in Portugal that is a blend of wines from several years. The best examples develop their color and nutty flavor while being aged in wood casks for decades. Its rich body stands up well to the assertive flavor of Stilton while mirroring the Starkrimon’s sweetness.